This is the UR Pro-T Wrench. This is a very versatile and unique tool for nitro racing, and is bound to be a one of the most valuable tools in your toolbox. 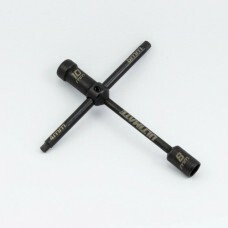 Part of the UR Pro Tools line, this combination tool includes several useful tools that will benefit any nitro racer: As a 10mm socket wrench for loosening/tightening clutch nuts, as a 8mm extended glow plug wrench, and as a 5mm hex bit for 5mm allen nuts or adjusting pivot ball suspension. The lightweight design ensures the tool is super light while still ergonomic for comfortable operation and maximum grip. With Ultimate Racing logo engraved.